Best Buy to offer LG Fathom for $99 upon launch? With Windows Mobile 6.5 as virile as a 100 year old Titanic survivor, any new model packing this OS (except for the HTC HD2, of course) is bound to be looked at like a museum piece. Enter the LG Fathom which is expected to get launched soon by Verizon. This handset has some modern specs that actually keeps the device almost as fresh as the latest Android phone. Powered by a 1GHz Snapdragon processor, the Fathom's 3.2 inch display has resolution of 800 x 480 pixels and a landscape sliding QWERTY keyboard. Just to make it clear, this is not your Grand Dad's Windows Mobile phone. We have already reported that Verizon will release this handset via its B2B outlets on May 27th with a June 3rd launch across all other channels-but those dates have not yet been confirmed by Big Red. 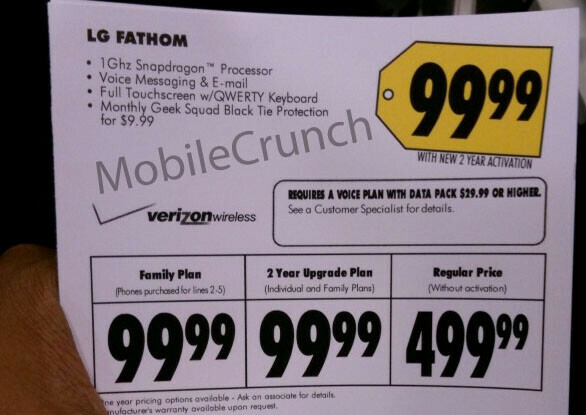 And while we also do not have an idea on how Verizon will price the phone, we do have a leaked photo of the LG Fathom's display over at Best Buy. From the looks of things, the big box retailer is offering the model for $99.99 with a 2 year contract or $499.99 sans contract. This could be the last hurrah for Windows Mobile 6.5, so if you are a fan of the platform and you're on Verizon, you might want to give the LG Fathom a good look.